Mustard understands IP protocol – we have been using it to run client networks for years. Phones now use the same technology and we are able to manage all of our clients’ IT and telephony needs centrally over the same infrastructure. Mustard can enable home workers with the same network resources enjoyed by their colleagues in the office and configure an IP handset to operate as another telephone extension with all of the same features. VoIP telephony makes use of internet connections, which means calls to other phones on your network such as branch offices in different towns – or different countries – effectively become ‘free of charge’. Of course, costs will apply when you need to break out into the public network to phone other destinations. Recent years have seen a convergence in computer and telephone technology. But as traditional analogue phone systems adopted modern IP protocol, this was not a case of two product sets simply meeting in the middle. With the advent of IP phone systems, it was telecommunications technology that had to cope with the biggest changes and, with traditional analogue phone installers struggling to keep pace, this put IT companies like Mustard in a strong position. Today Mustard is able to consult on and deliver modern business phone systems including VoIP (voice over IP) telephony which make use of your network infrastructure and internet connectivity to deliver state-of-the-art solutions with features that include call conferencing, hot desking, mobile pairing and voicemail to email. 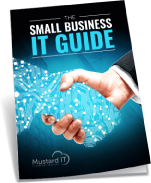 Talk to Mustard about computer telephony integration to link your business phone system to your Outlook database or initiate call recording on demand. We can help you run your network and your office phones over the same infrastructure, whilst managing bandwidth to avoid disruptive bottlenecks. Modern phone systems operate using IP protocol, a system Mustard has been using for years to connect PCs to business servers. Our team will help you save cost and increase efficiency by managing phones and computers over a single integrated network.